A wonderful place to sit back and relax- very well equipped with close proximity to shops etc. Lovely pool, has all you would need. Everything. The appartment is big, clean, well maintenance, amazing . The appartment is cosy and warmed. Well equipped with everything you need. All the communication with marinos was very good. We enjoyed a lot from the yard- the pool, table tennis and the view all over.Very close to all the attractions in the Trodos. The villa is beautiful inside and out, spacious, clean and equipped with everything you could possibly need and more. Lots of lovely personal touches, including wine and chocolates. A lovely swimming pool and we enjoyed playing table tennis too! The view is amazing and the location is so peaceful and beautiful. I could happily live there!! Lock in a great price for Roses Villa – rated 9.9 by recent guests! Fitted with wooden floors and modern furnishings, Roses Villa consists of 4 bedrooms and 3 bathrooms with shower or bath tub. It comes with a dining area and a seating area with an LCD TV and a DVD player. A fridge, a stove and a dishwasher are available. The property provides you ingredients to prepare your own breakfast, such as bread, milk, cheese, jam, butter, coffee, tea, sugar and cereals. Roses Villa is located 16 mi from Limassol Town and 45 mi from Larnaca International Airport. Avdimou Beach is at 22 mi, while Troodos Mountain is 12 mi away. Free private parking is possible on site. This property also has one of the top-rated locations in Trimiklini! Guests are happier about it compared to other properties in the area. 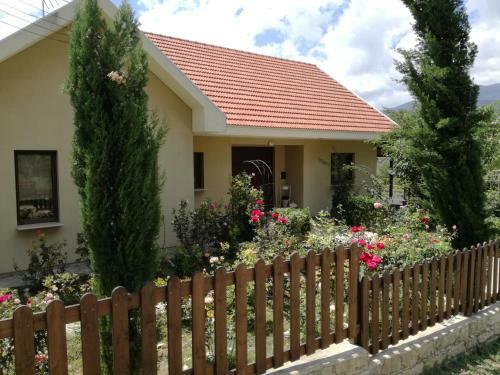 This property is also rated for the best value in Trimiklini! Guests are getting more for their money when compared to other properties in this city. When would you like to stay at Roses Villa? -private parking for 2 vehicles. House Rules Roses Villa takes special requests – add in the next step! Guests are advised to have their own vehicle. Please note that organizing parties is not allowed. Please inform Roses Villa of your expected arrival time in advance. You can use the Special Requests box when booking, or contact the property directly using the contact details in your confirmation. Great location peaceful and relaxing, everything you need if you have a large family. This made our Xmas a bit more special, can't wait to come back in summertime. There is no air con in the main living area so it get quite warm in the evening. Nothing - every single thing was fabulous!